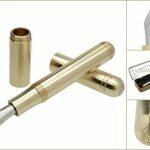 The Kaweco Supra Fountain Pen is an all new model designed similar to the Kaweco Liliput Fountain pen. 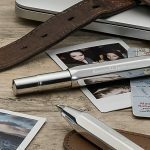 The new Kaweco Supra pen has a slightly larger diameter barrel than the Liliput but it also comes with an extension. 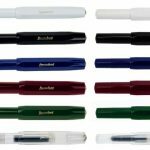 The optional extension does not have to be used but it makes the pen about 1 inch longer. 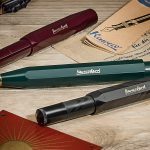 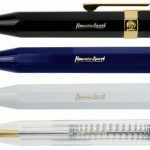 This new Kaweco pen will be made with an all brass cap and barrel and a stainless steel nib that will be available in extra fine, fine, medium, broad, or double broad tip sizes. 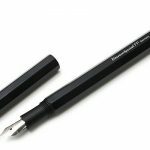 This Kaweco collection has an octagonal shape, body and cap in black aluminium. 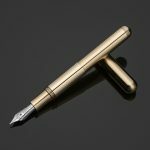 The fountain pen fits a standard converter/cartridge filling system and the cap can be screwed on the bottom.Steel nib medium size. 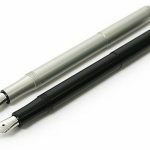 The ballpoint and the mechanical pencil are available in two sizes (short and long). 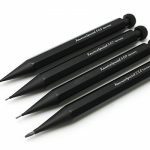 In particular, the mechanical pencil, is available with 4 lead widths: 0,5mm, 0,7mm, 0,9mm, 2mm.